Even though the Atlanta Falcons haven’t won a game in Chicago in 34 years, the Bears are going to have their hands full with defending the NFC Champions. Going up against a loaded roster, the Chicago Bears will be tested in every aspect of the game. 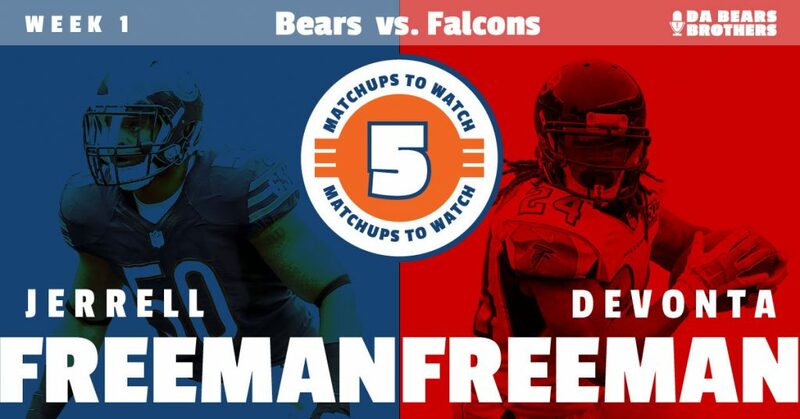 Here’s a look at five matchups that will play a major role on Sunday at Soldier Field. I Originally had this matchup pegged as “Prince Amukamara vs Julio Jones,” but with Amukamara not practicing on Thursday, his availability for this game is in serious question. So just like the Bears, I’ll have to make an adjustment. If Amukamara is unable to play in the season opener, the duty of covering one of the game’s most dangerous receivers will fall on either Marcus Cooper or Kyle Fuller. Realistically, it would probably be a combination of the two, depending on where Jones lines up on any given play. Regardless of who is covering Jones, it’s going to be important to keep him in check as much as possible. If you count the Super Bowl, Jones did not score a touchdown in four of Atlanta’s six losses last season. It will be difficult to eliminate him from the game, and quite frankly, I don’t see Chicago being able to do so. This is especially true if Amukamara doesn’t play. Coming off a career-best seven sacks in 2016, Hicks is poised for another big season. He begins the year with a friendly matchup as he’ll be lined up across from Schweitzer (a former sixth-round pick) who is making his first career start. There is no reason why Hick’s can’t take advantage of Schweitzer’s inexperience on Sunday. I’m expecting big things out of Hicks and anticipate him making some plays in the backfield on Sunday. All eyes will be on Leonard Floyd, Willie Young, and Pernell McPhee to get to Matt Ryan, which should (hopefully) allow Hicks to fly slightly under the radar, and get some one-on-one matchups, which he should win. This will be a fascinating matchup to watch on Sunday. These two may not technically line up against one another, but both will be in charge of getting their guys lined up correctly and on the same page. Ryan only threw seven interceptions last year on 534 attempts. That’s an interception on only 0.13 percent of his passes. Talk about some ball security. On the other hand, the Bears brought in Demps to be the guy to create turnovers. He led all safeties last season with six interceptions. Now, he doesn’t need a pick to make his impact felt on Sunday. Instead, Demps’ major responsibility is to make sure that the secondary knows the coverage on each and every down. If he can get the secondary to “gel,” the Bears front-seven should hopefully create enough pressure to disrupt the Falcons’ passing game. That said, it’s going to be a difficult matchup going against last year’s MVP. Uh oh … This matchup does not look good on paper. Or at least that’s what you would think. Everyone is well aware that Beasley led the NFL in sacks last season (15.5) but what some Bears fans may not remember is that Massie did not allow a sack after Week 4 of last season. Limiting Beasley is an obvious goal this week. He’s simply too disruptive. Plus, with Mike Glennon’s immobility, keeping the pocket clean must be a priority. Massie will have his hands full, and if he struggles on Sunday, so will this Bears’ offense. This is one of the more fun matchups to keep an eye on (and not because the two share a last name). Jerrell is a tackling machine. He’s quick to the ball, which is a big reason why he led Chicago in tackles last season with 110 combined, despite missing four games. Devonta, on the other hand, had an impressive 2016 campaign in which he rushed for over 1,000 yards, averaged 4.6 yards per carry, and reached the end zone 11 times on the ground. What makes Devonta even more dangerous is his presence in the passing game. Last year, he had 54 catches (hauling in 83 percent of his targets) for 462 yards and two scores. Luckily for Chicago, Jerrell was one of the best coverage linebackers in the entire league last season. In fact, he did receive the highest coverage grade according to Pro Football Focus.